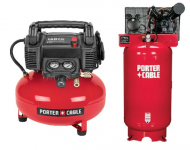 Need Porter Cable air compressor parts? We carry everything from that small Drain Tap that's leaking to Pressure Switches and Regulators. Need a brand new Pump assembly that's ready to bolt on? We have it! Find the Porter Cable replacement parts you need to get that air compressor running like new and working for you. Some of the popular parts we carry are Pressure Switches, Air Regulators, Gauges, Valve Plates & Piston Kits. We also have some helpful tech information under our "Tech Help" section, you can click on the below link to view categories on everything from trouble shooting your Air Compressor, maintenance, installation (and much more!) Our sales staff is willing to work hard to find the parts you need. Order spares of popular replacement parts!